Capture their heart, and sweet tooth, all at once with this gorgeous red arrangement. 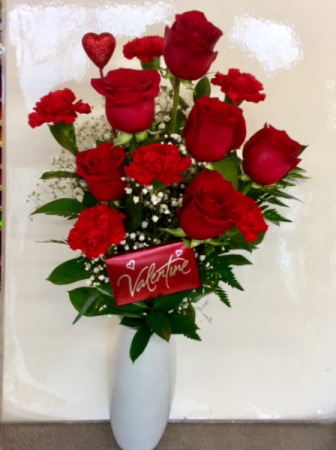 This arrangement includes premium roses, carnations, babies breath and a DeBrand fine chocolates milk Chocolate "Valentine" bar. 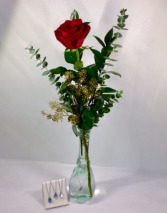 It is designed in a classy white glass vase and is accented with a glittery heart pick. 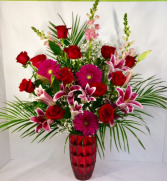 Show how crazy in love you are with this magnificent display of fresh flowers! Arranged in a stylish red mercury glass vase with a geometric pattern, this vase includes the most premium flowers. It has stargazer lilies, red roses, snapdragons, gerbera daisies, babies breath and robellini palms.